Happy New Year! It’s time to pack away the decorations, organize the home and look ahead to a new year. Looking forward to the next 12 months may bring about hopes of new beginnings, the potential to do better and perhaps the resolve to tackle both new and existing aspirations. 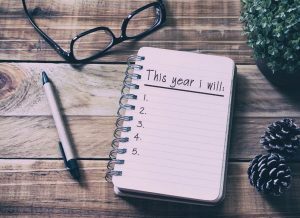 Whether you call them resolutions, goals or a to-do list, according to Forbes magazine, only 8 percent of people accomplish their goals. The truth is, creating a list of goals won’t bring you any closer to achieving those goals. Whether you’ve decided to lose weight, stop smoking or earn more money, there are several steps to take to achieve success. Start with small, attainable goals for the entire year. Instead of making this a bucket list, choose two or three goals to accomplish. Set goals that are tangible. Instead of planning to lose weight, plan to lose a certain amount of weight within a specific time period. Keep track of your goals and progress in a format that you can see daily. Also, enlist your family or friends to assist with holding you accountable. In order to achieve, you must believe. You have as much willpower as you think you have, essentially. Whatever you resolve to achieve this year, you have accomplished much more in years past. At some point in the year, you may encounter barriers, temporary or long-term, that throw you off track. Or you may abandon one or more resolutions for one reason or another. In these instances, its important to be aware of your thoughts and feelings. Keep in touch with supportive, caring people. Talk about your feelings with friends or family or mental health professional. No matter the time of year, remember to take it day by day and take care of yourself.